Mexican prickly poppy, Argemone mexicana, is, oddly enough, prickly. It is native to Mexico and parts of the American Southwest, but has also found homes throughout the world, particularly India. I’ll get straight to the point: it’s a weed. I’ve seen them in New Mexico, and it seems to thrive in dry, barren soil in ditches and along roadways. The flowers are pretty enough, if you’re into the poppy look. And it hurts. That whole “prickly” thing. I sure wouldn’t want to sit on it. Full disclosure – I once sat on a cactus while working for the U.S. Forest service in southern Colorado. I don’t recommend it. But for all its warts it has traditional uses. 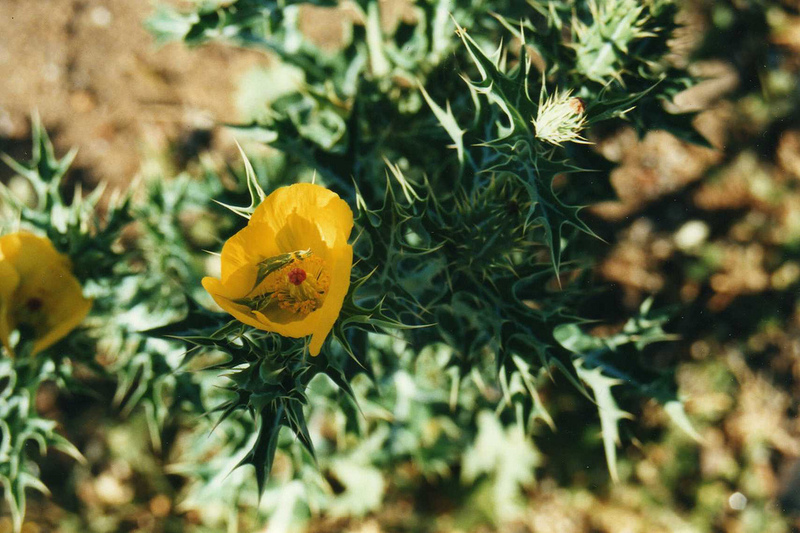 In the Altiplano, a high elevation (6000′) plateau in northern and central Mexico, the prickly poppy has been used by traditional healers to treat oral bacterial diseases (1). Healers use infusions made from the leaves for tooth decay and gum disease. One primary cause of such decay and disease is the bacteria streptococcus mutans, and experiments with prickly poppy extracts demonstrate its antibacterial effects (1). Wanting to get in on the tooth decay action, research into the active ingredient in these prickly poppy formulations was started, and it was found that the alkaloid sanguinarine was responsible. Sanguinarine is a benzylisoquinoline that is found in the leaves, roots, seeds, and latex of the prickly poppy. [The latex is the ooey-gooey milk-like sap that forms in the poppy’s seed pod. This is analogous to obtaining morphine and other opiates from opium poppy latex, just that the prickly poppy contains no opiates that I’m aware of.] So because of its traditional use, why not throw sanguinarine into toothpaste and mouthwash? We did, Viadent being one of the products, with the idea that it would work as an anti-plaquing agent. But things didn’t work out so well. It seems that there is a strong correlation with using these sanguinarine containing mouthwashes and toothpastes with leukoplakia (2). Leukoplakia are areas of white patches in the inner cheeks and gums in the mouth. It isn’t a disease in and of itself, but is associated with oral cancers, with about 1% turning malignant, and is often called a precancerous lesion (3). Now, there are others that don’t believe this, and have done their own studies and number crunching, and found that there is no correlation between sanguinarine and oral leukoplakia (4). And the doubters may be right, but personally, and knowing that there is a risk with everything we do and put into our bodies, the reward of perhaps a little less plaque versus the risk of potential oral cancer isn’t worth it to me. I’ll leave y’all to make up your own minds. I can’t leave it like this though, with a maybe it’s bad for you. We need something definitive, right? And we have it in the case of epidemic dropsy. 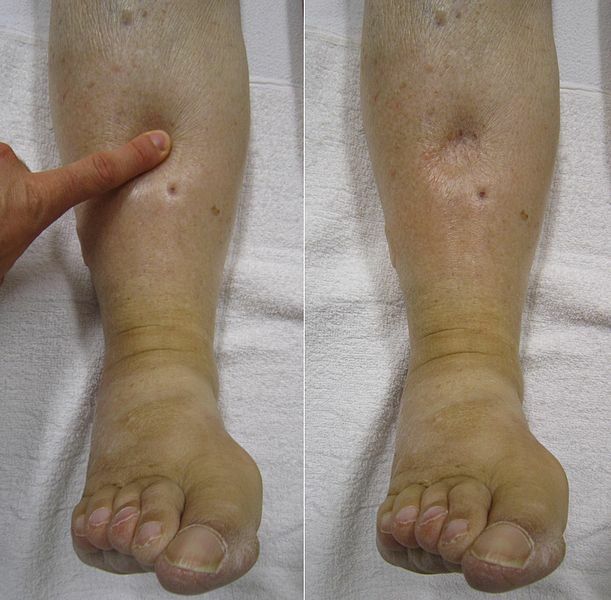 Dropsy is the old-school word for edema, and is a medical issue characterized by an excessive accumulation of fluid in tissue spaces (also called interstitial spaces). There are many causes of edema, but the one I’m going to focus on is caused by sanguinarine via the prickly poppy, naturally. The majority of epidemic dropsy outbreaks occur from the ingestion of oil made from Argemone mexicana. The major outbreaks, occurring in India, have been due to contaminated mustard oil. Prickly poppy, a weed, grows among mustard plants in the fields and can be harvested along with the mustard. The first known outbreak of this sort occurred in West Bengal in 1877, with subsequent outbreaks occurring every decade or so throughout India and the region. One of the most severe outbreaks occurred in 1998, with a recorded 2552 cases resulting in 65 deaths (5). The actual numbers are likely to be higher due to poor reporting and access to medical care, but historically, the mortality rate is about 5%. The mechanism of sanguinarine induced edema is not completely understood, but is most likely associated with its inhibition of the cells sodium/potassium-pump. As a consequence there can be a decreased blood flow to the kidneys, resulting in the retention of sodium and water throughout the body. While this may not sound serious, it has drastic effects on the cardiovascular system, and people that succumb to sanguinarine toxicity typically die from a cardiac event (5). The symptoms of toxicity, besides the obvious edema, are fever, palpitations, tachycardia, and increased blood pressure. There is no “cure” for this, though measures such as dialysis has been attempted, but most often just supportive care is employed. Sanguinarine induced edema can last for several months. But besides the edema, there is also the threat of developing glaucoma, which has been reported in up to 10% of cases (6). There is hope, however, as technologies are now enabled to detect sanguinarine in various oils, as well as cultivating yellow mustard seeds so that the black prickly poppy seeds can be readily identified. So hopefully these outbreaks are becoming a thing of the past – or perhaps Monsanto will make patent a “Roundup Ready” mustard plant. We can only hope….sarcasm is hard to read, but it’s there, trust me. So a lesson for all you Foodies out there, don’t cook with unlabeled mustard oil, you just never know what you might end up with. 1. Rosas-Piñón, Yazmín, Alicia Mejía, Gloria Díaz-Ruiz, María Isabel Aguilar, Sobeida Sánchez-Nieto, and J. Fausto Rivero-Cruz. “Ethnobotanical Survey and Antibacterial Activity of Plants Used in the Altiplane Region of Mexico for the Treatment of Oral Cavity Infections.” Journal of Ethnopharmacology 141.3 (2012): 860-65. 2. Mascarenhas, Ana Karina, Carl Michael Allen, and John Loudon. “The Association between Viadent® Use and Oral Leukoplakia.” Epidemiology12.6 (2001): 741-43. 3. Mascarenhas, Ana Karina, Carl M. Allen, and Melvin L. Moeschberger. “The Association Between Viadent® Use and Oral Leukoplakia-Results of a Matched Case-control Study.” Journal of Public Health Dentistry 62.3 (2002): 158-62. 4. Munro, Ian C., Elizabeth S. Delzell, Earle R. Nestmann, and Barry S. Lynch. “Viadent Usage and Oral Leukoplakia: A Spurious Association.”Regulatory Toxicology and Pharmacology 30.3 (1999): 182-96. 5. Sharma, B. D., S. Malhotra, V. Bhatia, and M. Rathee. “Classic Diseases Revisited: Epidemic Dropsy in India.” Postgraduate Medical Journal75.889 (1999): 657-61. 6. Sachdev, M. S., N. N. Sood, L. K. Verma, S. K. Gupta, and N. F. Jaffery. “Pathogenesis of Epidemic Dropsy Glaucoma.” Archives of Ophthalmology 106.9 (1988): 1221-223. Tags: Argemone mexicana, edema, epidemic dropsy, glaucoma, prickly poppy, sanguinarine. Bookmark the permalink.